Clip art is the name given to over 150,000 readymade illustrations offered by Microsoft for use in its various Microsoft Office programs, including Excel 2007. Clip art drawings are so numerous that the images are classified into different categories ranging from Abstract to Web Elements. 1Click the Clip Art button in the Illustration group on the Ribbon’s Insert tab. 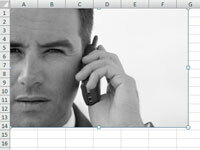 Excel 2007 displays the Clip Art task pane, where you search for the type of art you want to use. 2Click in the Search For text box and enter the keyword(s) for the type of clip art you want to find. When you enter keywords for finding particular types of clip art, try general, descriptive terms, such as trees, flowers, people, flying, and the like. 3(Optional) Click the Search In drop-down button and remove (deselect) check marks from any clip art collections that you don’t want to search. By default, Excel searches all the collections of clip art (including the Microsoft Office Online collection on the Web). To limit your search, you need to make sure that only the clip art collections you want to include in the search have check marks before their names. 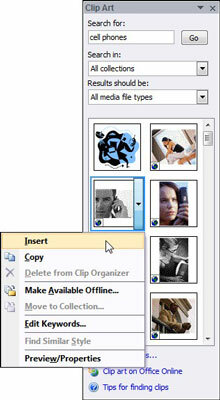 4(Optional) To limit the search to Clip Art only, click the Results Should Be drop-down button and remove check marks from the All Media Types, Photographs, Movies, and Sounds categories. You can further limit the types of clip art files included in the search by clicking the plus sign in front of Clip Art and then removing check marks from any types of clips that you don’t want or need to use. 5Click the Go button to the right of the Search For text box to initiate the search. Excel displays several images that match your search keywords. 6Select and insert the desired clip art image. Positioning the mouse pointer over the image you want to use to display its drop-down button. Click the drop-down button and choose Insert at the top of its drop-down menu. The clip art image appears in the worksheet. 7Move and resize the image as necessary. Clip art graphics are normally a bit larger than you actually need them to be. click and drag the circular resizing handles around the outer edge of the image to make it the right size, and then click and drag inside the image to position it where you want it.